These trips have shown us how much innovation work can still be done in the fishing industry. We have had contacted with industry players in The Philipines, after calling Hong Kong and before holding meetings in Shanghai and Ningbo and we have been positively surprised by a particular fishing private company model, called The Mactan Fishing Sanctuary (Cebú, The Philippines). Fishing Accelerator is about disruptive technology very close to market, but disruptive business models are attracting our attention too. This fishing sanctuary has been developed by Mactan Sangri-La Hotel, Amores Charities, Inc. and Scotty’s Action Sports Network, in cooperation with local Philippines authorities. 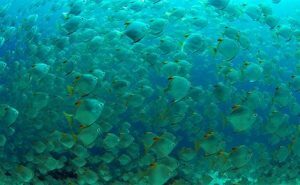 It comprises a 60,000 m2 fishing protected area and it teems with over 160 species of fish, shellfish and coral. It is the first resort in The Philippines to achieve ISO 14001 certification. The internationally recognized standard for the environmental management of businesses is a culmination of the resort’s initiatives towards becoming a real environment-friendly resort facility. This initiative proves that there are more options than sophisticated and costly fishing protection models lead by Public Authorities. Business driven solutions can be an alternative to achieve ocean protection. That is why Fishing Accelerator is a private company’s model, looking for the best cutting edge technology for the fishing industry competitiveness.